Even in the land of movie stars and storybook endings, who could've scripted this? 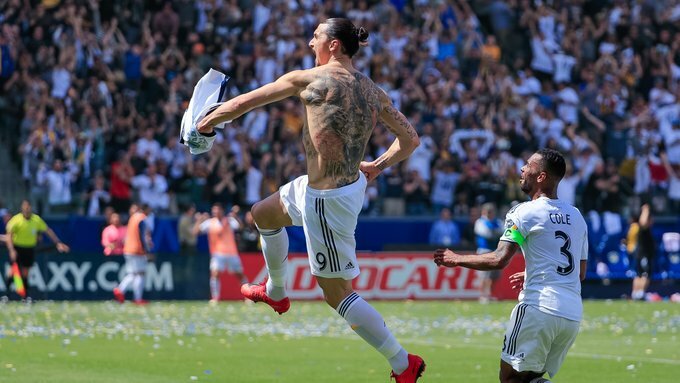 Less than 48 hours after landing at LAX, Zlatan Ibrahimovic announced his MLS arrival in astounding fashion, striking a stunning 77th-minute equalizer before hitting a match-winning header in stoppage time as an encore. And when the dust settled on one of the biggest matches in MLS regular-season history, the LA Galaxy had come from three goals down for a stunning 4-3 victory over LAFC in the inaugural edition of a fixture fans have dubbed "El Trafico." The Swedish superstar came on in the 71st minute with the Galaxy trailing 3-1 after an outstanding first 50 minutes from the visitors at StubHub Center; Mexico international Carlos Vela notably logged his first MLS brace. Chris Pontius' header two minutes after the substitution cut the deficit to one. Then the man known around the world simply as "Ibra" caught hold of a volley some 40-yards from goal and hammered it over helplessly stranded goalkeeper Tyler Miller. LAFC had chances to steal three points late, with Marco Urena striking the post and Eduard Atuesta dragging an effort just wide. They would regret those misses, as Ibrahimovic had a winner to spare in his endless bag of tricks, taking an aerial duel to thump home a thunderous header and providing the Galaxy a miracle victory on an afternoon no one will forget.